8000 Premium Surface Mounted Door Closers are for All Medium to High Traffic Commercial Storefronts; Hollow Metal and Wood Door Applications. 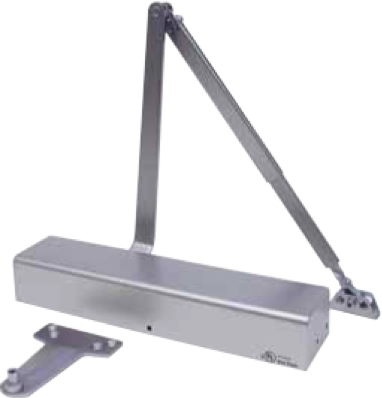 These Closers are Built on a 12" Hole Pattern, Manufactured from High-Grade Aluminum, and Packaged with All-Weather Fluid, Parallel Arm Bracket, Wood/Metal Self Tapping Screws, Full Cover, Mounting Templates Included for Regular Arm, Top Jamb and Parallel Arm Mount, Allen Head Adjustment Valves. This Closer Comes Standard with Power Adjustable Backcheck, Sweep, Latch, and 1-6 Spring Tension Valves. Available in Aluminum or Dark Bronze.